"If you're any good at this job, and I am, then every step in a murder case moves you in one direction: towards order." Scorcher Kennedy is at the top of his game. As a member of the elite Dublin murder squad, he is known for his by-the-book approach to solving tough murder cases. His meticulous process of making sense out of the chaotic may rub some of his peers the wrong way, but Scorcher always gets the job done. His unflinching trust in the process has garnered him the highest solve rate of the squad, a distinction that inspires his superiors to assign the squad's rookie as his partner. Kennedy is tasked with showing the rookie Richie the ropes, and their first case together turns out to be a real tough one. A small housing development named Brianstown features the few suburban homes that were built before the economic crash brought all construction to a halt. The broken potential of that development spreads into one of the homes where a gruesome crime scene awaits. The father and two children lay dead in the home, brutally murdered. The mother lies in a hospital bed battered and barely clinging to life. With all the misfortune that has befallen the area, perhaps it is better to be called by the name it previously held. . . Broken Harbor. Kennedy certainly has his work cut out for him. The scene seems to be an apparent murder-suicide where the father who lost his job killed his family. But there is more here than meets the eye. Mysterious happenings in the home may lead to completely unexpected results. Kennedy is as focused as he can be, but memories of this particular place keep invading his consciousness. Now more than ever, he must face his tragic past head on for the good of the case. After being a tad underwhelmed by her previous effort, I'm happy to report that Tana French achieves a near perfect novel with Broken Harbor. Her penchant for slow building mysteries scattered with well-drawn characters is on full display here. I'd even go as far as arguing that the family drama and reconciliation with the past is more important than the actual mystery. There is a sense of suspense and impending revelation that grows with the turn of each page. The plot moves slowly, but I was completely engrossed in every detail. Each novel in the series focuses on a different character, so this is one of the few series that I don't find it necessary to have read the previous novel. Still, readers of French's other works will find an added depth from their knowledge of these characters' past appearances. Broken Harbor has reignited my enthusiasm for French's writing and inspired me to continue reading her remarkable series. 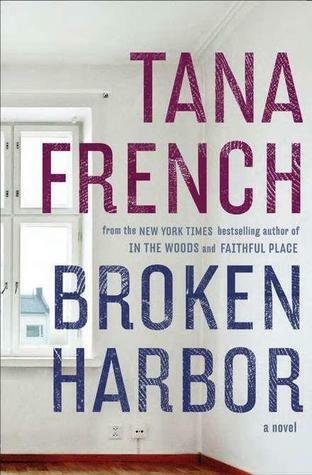 This entry was posted on Monday, December 4, 2017 and is filed under Book Review,Broken Harbor,Family Drama,Mystery,Suspense,Tana French,Thriller. You can follow any responses to this entry through the RSS 2.0. You can leave a response. I've been craving this genre lately and this sounds like an intriguing murder mystery. Thanks Ethan! I really enjoy her novels!